Sometimes I like to paint in a realistic style. 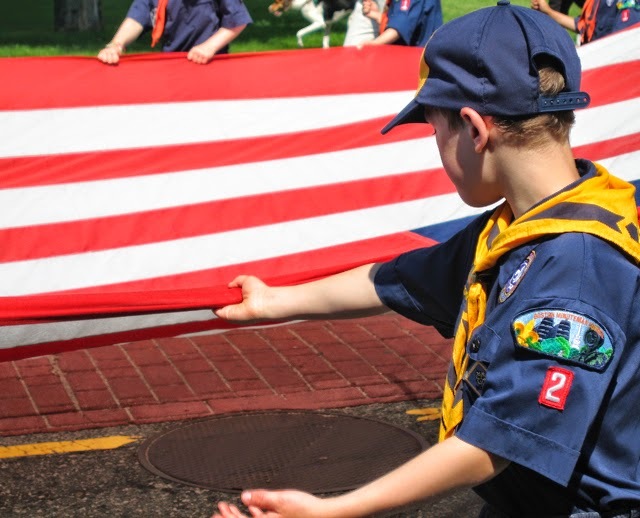 This photo I took, of a Cub Scout marching in a Memorial Day parade, challenged me in several ways. I wanted to render the figure carefully, and also be faithful to the areas of skin-tone, sunlight and shadow. Doing close-up work was another aspect of this challenge. Adding hair, and the stitches on the fabric, meant using a very small brush and painting by 'suggestion' rather than an emphatic statement. After determining which details to keep (e.g. the little boys in the background) and which to eliminate (e.g. the brick paving, because it distracted from the red stripes in the flag), I penciled in basic shapes. I used a photo-copy overlay with graphite paper underneath to trace the large shapes and maintain their general proportion and positioning. I then began to add color –– a mix of indigo and cobalt –– working from top to bottom. (Sometimes I work from right to left, because I'm left-handed.) 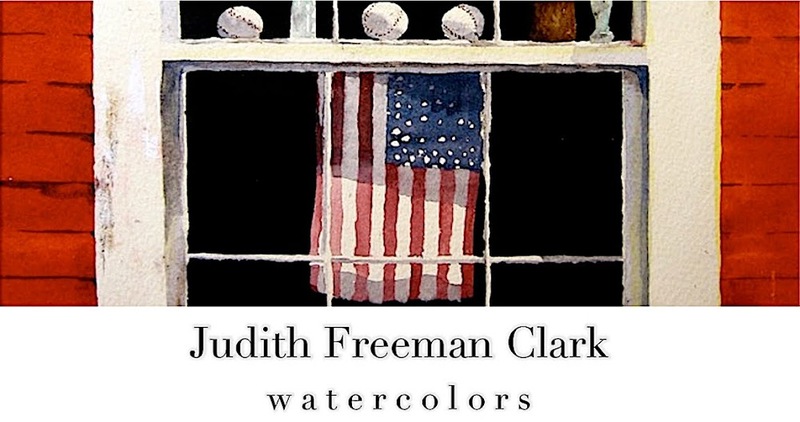 I chose to complete the figures in foreground and background prior to adding the flag in the middle-ground. After the blue areas were completely dry, I floated in the beginning of pale skin tones, then allowed them to dry fully, as well. (There is nothing more frustrating than watching colors bleed into each other when you don't want them to!) Again dampening the paper in specific areas, I dropped blues into the cap and sleeve. The wet-in-wet technique created the beginning of shadows and highlights and suggested soft, fabric texture. I moved slowly to the bottom of the painting, completing the first pass of blue in the foreground figure. I left white space in areas that would later be multi-colored Cub Scout insignia. I used a second primary color –– yellow –– for the kerchief and just-visible emblem on the boy's cap. This was done using a light wash, wet-in-wet, of new gamboge, yellow ochre, and cadmium yellow light. This color mix was allowed to dry thoroughly, before I worked further on the figure. For shadows on the skin, including the arms, I used multiple pale washes of winsor violet mingled with burnt sienna. The latter, in richer intensity, was used for the hair at the nape of the boy's neck. I painted darker shadows on the ear using sepia, and a dark mix of indigo and cobalt suggested the shadow on the the underside of the bill of the cap. I finished adding the hair, and then painted the Scout insignia, using several colors. For the badges, my goal was to give an impression rather than an accurate rendition of each detail. Next, came the kerchief. I made certain that the shadowy folds were not too dark. For the latter, I used several washes of quinacridone gold, with a touch of burnt sienna for the darkest shadows. The red troop number badge was done in cadmium red, which I also used as I began painting the stripes in the flag. Having finished both the foreground figure and the flag, I was ready to add background figures. I questioned whether to render significant amounts of detail. In the end, I chose to paint the figures without worrying about details –– insignia, buttons, etc. –– the three boys in the background were supporting players, not stars of the painting! My final steps were to add black-top pavement, and the white traffic lines. 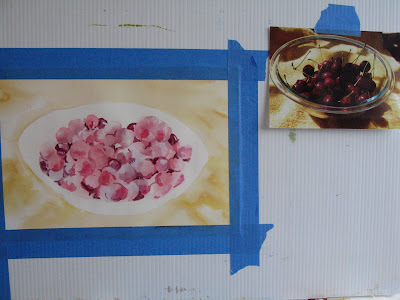 To do this, I first masked off the completed portions of the picture, using tracing vellum and painter's tape, making certain that everything was stuck down tight. Then I mixed a medium-cool gray (sepia and French ultramarine blue) and with a toothbrush, I spattered on multiple layers of paint. I allowed each layer to dry in between spattering. Two years ago, I was on a sabbatical leave from my position as a parish priest. My goal during that leave was to devote more time to creative pursuits. I came across this entry from a blog that I kept during my sabbatical, and thought it would be of interest if I posted it here, since it shows the way one of my paintings took shape. "First Week of June, 2011"
My painting is going well... the bright, sunny days definitely make a difference for me, as I can see light and shadows in ways that translate to the process of putting paint on paper. Yesterday I resumed work on a painting I'd sketched out more than a year ago. It's from a photo I took in 2009, when Robin and I vacationed at Maryland's Eastern Shore, in a cottage on the Chesapeake Bay. Many images that appeal to me are of places, people, or objects I've photographed some time ago. It seems that memory gives these images an appeal and resonance lacking in more immediate views -- almost as if the pictures need to sit in my mind, where they become familiar entities with fond attachments to something/someone in the past. Yesterday evening, I was re-reading "Beauty: The Invisible Embrace," by the late John O'Donohue. He writes: "Memory is the place where our vanished days secretly gather." This may be what's working in me as I latch onto an idea of what to paint next. In the case of the bowl of cherries, my cherished recollection is of a leisurely summer afternoon, fresh fruit, sun-light bouncing off the water -- truly a memory to savor.